Tamanu oil is a precious, exotic oil that’s derived from the tamanu nut, grown on Ati trees which are native to the South Pacific. The tree itself, scientifically known as Calophyllum inophyllum, was discovered thousands of years ago by native Tahitians, while the oil has been around for centuries, used to help heal a wide range of skin conditions. In fact, it’s remained an essential part of tropical cultures in this part of the world. The tree produces a small yellow fruit that has a large nut kernel inside which is where the rich oil can be found – it’s not easy to obtain, as the nuts must first be laid out in the sun for up to two months, and kept away from moisture. As they dry, a dark, sticky oil appears on the surface which is then harvested and processed into tamanu oil. Around the turn of the 20th century, news about tamanu oil and its ability to treat leprosy and relieve pain spread to the Western World, and by 1918, French scientists discovered its many beneficial topical uses, including the ability to help heal and regenerate skin. Despite its powerful properties, the expense and difficulty of transporting it to other regions outside of the South Pacific resulted in it being mostly forgotten for decades, until being rediscovered once again, right in the U.S. The majority of tamanu oil’s health benefits have been attributed to its high level of beneficial fatty acids, including about one-third oleic acid, one-third linoleic acid and about 10% stearic and palmitic acid. The remainder is made up of benzoic acid, terpenes, lipids, saturated fats, and antioxidants. The oil is said to not only offer antioxidant properties but antibacterial, anti-inflammatory, antimicrobial, analgesic and anti-neuralgic properties, among others. Tamanu oil can help prevent premature aging, helping to battle those signs like wrinkles and fine lines, thanks to its high level of monounsaturated and polyunsaturated fats which also function as antioxidants – that means that they’re able to seek out, find and neutralize free radicals. Free radicals can cause healthy cells to mutate, leading to chronic diseases like cancer, and they can also weaken the elasticity of skin, contribute to wrinkles and harm the skin’s own ability to regenerate. The important fatty acids found in the oil help to nourish and lubricate the skin to maintain firmness and elasticity. Offering even more anti-aging benefits as well as the ability to reduce the risk of developing skin cancer, research from France has found that the oil is able to protect against UV-induced DNA damage and oxidative stress thanks to its biological UV filter which has an SPF range of 18 to 22. Interestingly, Polynesians used the oil on their skin to protect it from harsh sunlight, so long before scientists proved that it works, people in the South Pacific knew this by actually utilizing what they had naturally grown in the islands. 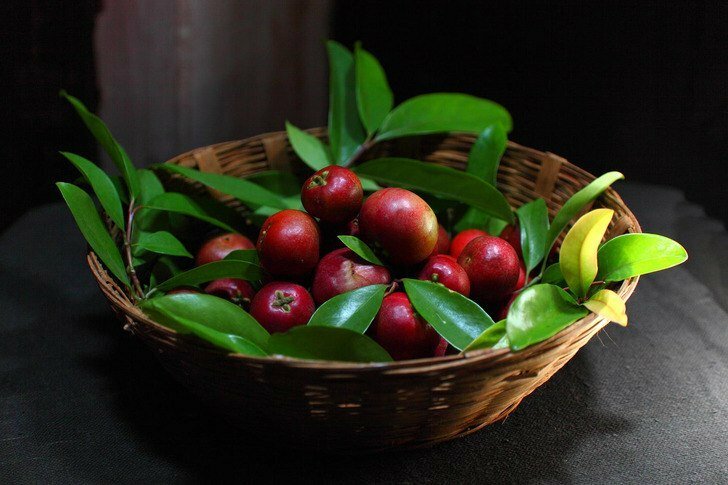 Tamanu oil is one of the best for healing skin conditions, including rashes and eczema, psoriasis as well as acne, sores, insect bites and other problems. It’s able to penetrate all three layers of the skin which allow its nourishing antimicrobial properties to work very effectively, getting to the root of the issue. It’s highly effective for fighting potential microbes that manifest as those common skin disorders. The oil has been extensively studied, including research from The Department of Biological Science and Technology, School of Pharmacy at China Medical University in Taiwan and was published in the journal Oncology. Experts confirmed its anti-inflammatory abilities and found that it was highly effective for numerous skin conditions. Add one drop of tea tree essential oil and one drop of tamanu oil to a cotton ball and dab it on the affected areas just before bedtime. Don’t rinse, allow it to penetrate overnight and then wash your face thoroughly in the morning. Researchers have also discovered that tamanu oil stimulates the growth of new healthy tissue, in a process scientifically referred to as “cicatrisation,” which is what makes it so healing. In 2002, a study by Beausoleil and Lehman published in The International Journal of Cosmetic Science, looked at its scar reducing the ability, which involved participants who had visible scars that were present for a least one year. The oil was applied daily for nine weeks and resulted in significant improvement in the appearance of the subjects’ scars. Their overall size has consistently decreased throughout the nine-week period, with their length diminishing by an average of 2.8mm, and their width by 1.2mm. Add the shea butter and cocoa butter to a Pyrex measuring cup. Heat the water in a pot on the stove over medium-low. Gently place the measuring cup inside, making sure the water doesn’t get into the measuring cup. The water will gently melt the cocoa and shea butter. Once melted, remove from heat, allow the mixture to cool slightly and then add the tamanu oil. Place the measuring cup in the refrigerator for about 20 minutes. Remove the cup and then add the lavender oil. Use a hand mixer to whip the partially solidified mixture until creamy. Rub the cream liberally over all stretch marks daily. Store the remaining cream in a clean, sterilized jar. Due to tamanu oil’s stimulant nature and antioxidant compounds, it’s also ideal for healing cuts, scrapes, bruises and other wounds. Its fatty acids and antioxidants help to stimulate the healing process of damaged cells, which helps to prevent or minimize the appearance of resulting scars. The Ancient Polynesians used tamanu oil to heal many different types of wounds, thanks to its antibacterial, anti-inflammatory and moisturizing compounds that speed up the rate at which wounds heal. You can gently apply tamanu oil on nicks, cuts and scrapes, bug bites, burns, sores and all sorts of other wounds using a cotton ball. Tamanu oil doesn’t just help a wound heal faster, it can relieve the pain as well. In Fiji, the oil was traditionally used for relieving the pain of sciatica, shingles, neuralgia, rheumatism and leprous neuritis. It can be readily be applied to sore, painful joints, as well as the pain that results from an insect bite or sunburn, and you only need to apply a tiny amount for it to be effective. In addition to its powerful healing and pain relieving abilities, tamanu oil is excellent for protecting the skin and soothing irritated areas, such as on the hands, feet or extremities and spots that tend to be prone to bacterial infection like the underarms. It’s cooling, anti-inflammatory, and moisturizing properties all work to reduce the severity of the irritation. Tamanu oil has a distinct nutty smell – a lot more pleasant than body odor, without a doubt. As a result, the oil can be used under the arms, as well as other areas of the body that tend to perspire a lot in order to reduce body odor. When used on the feet and toes, it can also help to eliminate a fungal infection, while also eliminating that awful foot odor. If you have a fungal infection, tamanu oil is ideal for getting rid of it. Just place four drops of it along with a drop of oregano essential oil onto a cotton ball and dab it onto the affected areas. It’s best done following a shower. You may want to get in the habit of using it every time you shower – and, if it’s a nail fungus issue, leave the cotton ball with the oil solution on the affected nail, holding it with a band-aid. Change it out at least once per day. There’s nothing worse than seeing your child in pain, and a diaper rash can be incredibly painful. Thankfully, tamanu oil can help both your little one and you enjoy relief. It’s been shown to help heal a diaper rash in just a day, and sometimes even faster, all without one chemical compound. If you’re a new parent or know someone who is, this oil may be one of the best things you can stock up on, or give, not only because of its ability to heal diaper rash but to fight off those other rashes common in infants, like eczema. It’s pretty much a cure-all, with its natural, healthy constituents helping the skin to heal faster. As the oil has the ability to penetrate all three layers of the skin, it can also get into your bloodstream to help boost your immune system thanks to its high level of anti-inflammatory, antifungal, antiseptic, antiviral and antibacterial compounds. It helps to fight against a wide range of pathogens along with environmental pollutants and irritations. Applying it serves as kind of an “immune system shield” for your skin, bolstering its first line of defense. When it comes to promoting healthier hair and a healthier scalp, tamanu oil is ideal. It provides moisture, restores shine, fights scalp fungal infections and reduces scalp inflammation. If your scalp is dry and flaky, this oil can come to the rescue due to its antifungal properties, which means no more dandruff and embarrassing flakes. As it can also penetrate through all three layers of the skin, it provides a significant amount of hydration too. If your locks are dry and lifeless, tamanu oil can help with that too – simply by running a bit through your hair and allowing it to sit about an hour before washing. It helps to replace lost oils, leaving you with better moisturized, healthier looking, shinier hair.